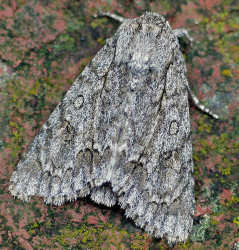 First recorded in 2012 at Middletown in the north-east of the county. This was the first record for north Wales. Since then it has been recorded at a further two sites, both in the north-east of the county. Wingspan : M & F, 40-45mm. Poplar Grey and Sweet Gale Moth. Overwinters as a pupa, in a double layered cocoon, sometimes more than one year. Larva July-Sept.